Harare, Zimbabwe - UPF-Zimbabwe organized a forum on the International Day of Families on May 19. Harare, Zimbabwe - During the World Day for Cultural Diversity for Dialogue and Development celebration on May 21, 2011, UPF gave a presentation about character education to students and teachers from 21 high schools. Harare, Zimbabwe - Rev. Jean Augustin Ghomsi, Southern Africa Sub-regional Director of UPF, introduced character education to 16 youth as part of an educational program from May 1-8, 2011. Harare, Zimbabwe - A December 11 conference on the theme "The Mission and Responsibility of Ambassadors for Peace” was attended by judges, doctors, businesspeople, religious leaders, and teachers. Harare, Zimbabwe - The UPF Secretary General worked with the UN Information Center, Iranian Embassy Cultural Department, Zimbabwe Olympic Committee, The Voice of Revival Ministry, and Fatima Zahra Women's Organization to organize a sports tournament and celebration of the UN International Day of Peace. Mutare, Zimbabwe - Bishops and missionaries of various churches from east and southern Africa as well as Zimbabwe paid tribute to Bishop Abel Muzorewa at his funeral in Mutare on April 17. 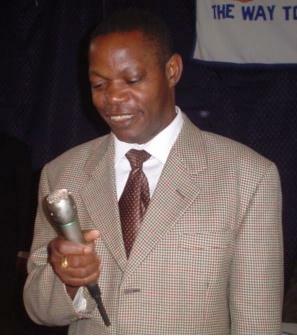 The service ended with a recording of Bishop Muzorewa singing, "Till we meet again." Harare, Zimbabwe - New Ambassadors for Peace were appointed at the conclusion of an educational program at UPF's Peace Embassy in Harare. The International Relief Friendship Foundation trained 20 women from a poor area of Harare in microfinancing on Oct. 27, 2007 and gave them a small grant to start selling vegetables. In Africa, when the poverty is so severe, people ask me, is God for Africa, too? When they go without food, there is tendency to ask, is God for Africa, too? Thank God, Africa is for all of us. And for all the things that have gone on in the past and those that may be in the present, we thank God because now we can feel protected, not by armies but by peace.